The waterfront town of Kittery provides a perfect introduction to all that Southern Maine has to offer. From dining with views to shop ‘til you drop shopping and more, Kittery is a perfect start (or end) to a drive up (or down) the region’s coastline and beyond. Visitors won’t go hungry in Kittery. Top spots for fresh seafood and much more are: famed Bob’s Clam Hut; Lil’s Café; and Chauncey Creek Lobster Pier out on Kittery Point. Shopping is equally popular and that’s especially true out on US 1, where outlet shopping and more await. Interesting shopping options include many outlet malls and shopping centers with all of the top brands, and Kittery Trading Post with their massive inventory. 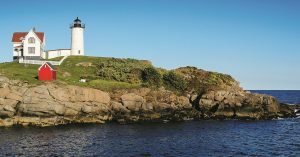 The “Yorks” area is famed as being the home of beloved Nubble Light and Stonewall Kitchen, Maine’s famed specialty food creators. The area includes York Village, York Harbor, York Beach, Cape Neddick, and more. Nubble Light is officially called the Cape Neddick Light Station and it was built in 1879 on a nub of land (thus, the nickname). Though it makes for great pictures, there is no public access to the island or Nubble Light. Other area possibilities include the Old York Historical Society, York’s Wild Kingdom Zoo & Amusement Park, and dramatic waterfront golf at Cape Neddick Country Club. Food is definitely at the forefront in the area, so there are many other tasty dining options, including Fishermen’s Dock, Dockside Restaurant on York Harbor, The Central Restaurant & Bar, and Fox’s Lobster House, which is adjacent to Nubble Light. For dessert, visitors won’t want to miss Goldenrod Kisses in York Beach. 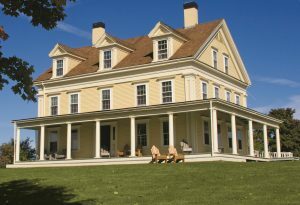 The York area also provides a perfect place from which to head west to several of Southern Maine’s inland attractions. Less than 10 miles to the northwest, Mount Agamenticus encompasses 13,000 acres of intact forest, including 40-plus miles of varied hiking trails. 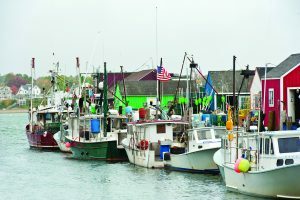 Busy Ogunquit is a quintessential Southern Maine coastal town. From classic beaches, ocean views, and walks to unique sightseeing, shopping, and fresh seafood, Ogunquit has much to offer. 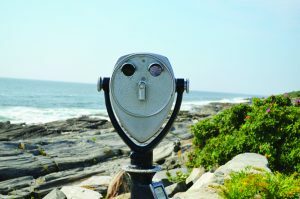 The most popular way to start an exploration of oceanfront Ogunquit is on the Marginal Way, a 1.25-mile paved walkway that winds right along the Atlantic Ocean. Walkers can start from town or at the “end” in Perkins Cove, a little port with popular dining, shopping, fishing, and varied boat tours. Back in town proper and nearby, there’s the Ogunquit Museum of Art, Ogunquit Heritage Museum, Ogunquit Fire Company Fire Museum, Barn Gallery, the Ogunquit Playhouse (featuring live musical theatrical productions throughout the summer since 1933), Beach Plum Farm, and lots of shopping. Beach Street leads out of downtown, across the Ogunquit River, to Ogunquit Beach. Dining is big business in Ogunquit. Top options include: Ogunquit Lobster Pound; Northern Union; Charlies; and The Lobster Shack, Barnacle Billy’s, and Oarweed Restaurant & Lobster Pound, all out in Perkins Cove. Just to the north, up US 1, the Wells area has much to offer, including seven miles of oceanfront, a working harbor, lighthouses, and the Rachel Carson National Wildlife Refuge. This area can also serve as a great base for exploring all of Southern Maine. The town of Wells features four beaches: Wells Beach, Crescent Beach, Drakes Island Beach, and Moody Beach. Back off of US 1, Wells Harbor is operated by the town and has a marina, fishing, and canoe and kayak rentals. Along with the rest of Southern Maine, there’s also easy access to The Eastern Trail, a 65-mile multi-use greenway linking Kittery and Casco Bay in South Portland. The area also features many unique restaurants. The options include: family-run Forbes Seafood Restaurant & Takeout (since 1921); Fisherman’s Catch Restaurant; Jake’s Seafood; Tulsi North (popular Indian cuisine and a sister restaurant of Tulsi in Kittery); and the Maine Diner. The Kennebunks are next and the easiest way to explore both towns and more is to continue on Port Road past the Rachel Carson National Wildlife Refuge and along the coast to Kennebunkport. Beach Avenue then leads right along the coast and several beaches before a short drive up to the Lower Village of Kennebunkport, and to the town’s famed Dock Square area. Bustling Dock Square is the place for lots of shopping and dining. Ocean Avenue leads out of Dock Square to the right and back towards the Atlantic. 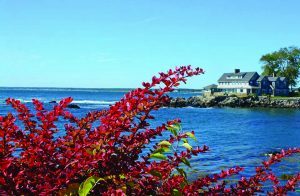 The great views on this short drive include several pull-offs for pictures of the Bush family’s coastal Maine compound, Walker’s Point. Other beloved Bush “presidential” sightseeing options in the Kennebunks include the Village Green, St. Ann’s Church, Anchor to Windward, and the First Families Museum at White Columns. There are varied ways to head back to US 1 and the town of Kennebunk, with a stop at the Seashore Trolley Museum (the largest and oldest electric railway museum in the world) providing an interesting diversion. The town is the area’s commercial center, but it also features the Brick Store Museum, illustrating the history of the Kennebunks. The town of Biddeford has two unique dining options in The Palace Diner (opened in 1927 in what is believed to be Maine’s oldest dining car) and Pizza by Alex, which has served Greek-style pizza since 1960. Across the Saco River, Saco is an old mill town that includes shopping, dining, and more (including The Run of the Mill Public House & Brewery) in and near some of the huge former mill buildings. Old Orchard Beach is next, with a classic Maine beach town awaiting visitors. 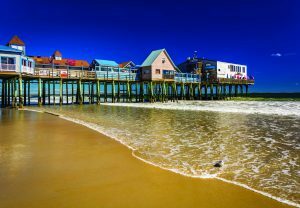 Along with a seven-mile beach, other attractions include an oceanfront amusement park that first opened in the early-1900s, a pier, beach-y shopping options, and fresh seafood and more. 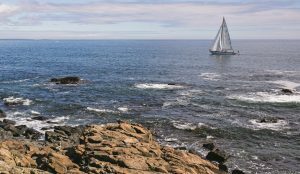 Maine’s largest city at 65,000-plus is one of America’s “hot” destinations for good reasons and serves as a great end to an exploration of Southern Maine. 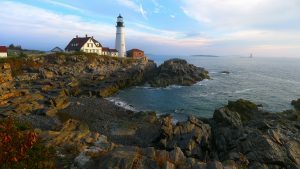 Situated on Casco Bay and just 50 miles or so from Kittery and the state line, Portland’s bustling Old Port, lighthouses, varied attractions, and more are all Southern Maine musts. Known as Henry Wadsworth Longfellow’s “City by the Sea,” downtown Portland is generally divided into four districts: Waterfront District; Old Port District; Arts District; and Government District. Most sightseeing, shopping, dining, and more is found in the first three. A city tour with Portland Discovery Land & Sea Tours is a great way to get an overview of the city. Their “Portland City and Lighthouse” tour on their trolley features a 105-minute, fully-narrated tour that provides a perfect introduction to Portland’s history, hidden gems, and much more. Among even more tour options, there are also the “bus/boat” land and sea tours with Maine Duck Tours. Those who like bike will want to contact Summer Feet Cycling and The EnCYCLEpedia. Lighthouses are on many tour itineraries. Greater Portland features six awe-inspiring lighthouses. After an introduction to Portland’s sightseeing options on land and at sea, it’s time to explore. Most visitors find Portland quite walkable. The Waterfront District is the perfect place to start, with the Portland Visitor Center (14 Ocean Gateway Pier), lots of restaurants and shopping, several sightseeing possibilities on land and sea, the Portland Science Center, and the Casco Bay Ferry Terminal for boat trips near and far. Among many unique offerings on the Waterfront, Lucky Catch Cruises near Portland Lobster Co. feature varied cruises that highlight Portland’s history, lighthouses, and lobster industry, including hauling up lobster traps. The cobblestoned streets of the Old Port District proper have even more sightseeing, dining and shopping. Rebuilt after a fire in 1866, the brick and cast iron buildings provide an authentic downtown shopping and dining experience. Just a mile to the northwest of the Arts District proper, the art of baseball is practiced by the Portland Sea Dogs at Hadlock Stadium. The dining options in Portland are among the best in Maine and the Northeast. Of course, fresh seafood reigns supreme, but Portland’s options range even further afield. Downtown possibilities include: DeMillo’s (a Portland classic for good reason); Eventide; Scales; and BaoBao Dumpling House for creative dumplings and more. 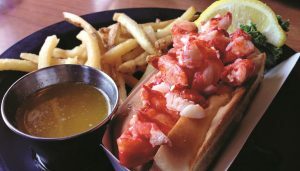 Of course, a traditional lobster dinner or a lobster roll (traditionally served on a hot dog bun) are must-eats. Restaurants throughout Greater Portland will accommodate and many offer waterfront views. Maine Foodie Tours also offer a great way to take a bite out of Portland, with several themed tours visiting four to seven locations for tastings. They also have tours in Kennebunkport to the south and Bar Harbor, Rockland, and Camden to the north. Portland’s craft beer scene is as hot as the dining scene. One great way to enjoy the scene without drinking and driving is through The Maine Brew Bus. They offer up to 12 all-inclusive tours a week on their bright green bus throughout the year, with more than 20 producers on their list of possibilities. The Great Lost Bear is another efficient option, with 72 beers on draft (more than 30 brewed in Maine and many more from the rest of New England and the Northeast). For those who consider shopping as important as eating and drinking, Portland doesn’t disappoint. Lots of unique shopping can be found throughout town, including: Lisa-Marie’s Made in Maine; Cool As A Moose (apparel and more); and Shipwreck & Cargo. 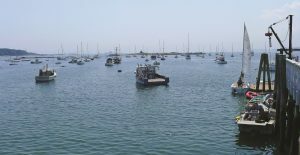 The area around downtown Portland is also well worth exploring, including the East End (with Fort Allen, East End Beach, and more), East Bayside, Parkside (home of the Portland Sea Dogs), the West End, South Portland, and Portland Head Light (in Cape Elizabeth).